I have been given this product as part of a review the the Chronic Illness Bloggers network. Although the product was a gift, all opinions in this review remain my own and I was in no way influenced by the company. I was skeptical about the program at first because honestly it sounds too good to be true. That something this seemingly simple could possibly cure me, when I’ve had Chronic Fatigue Syndrome (CFS) and Fibromyalgia for almost four years now. I mean my doctors that I see on a near weekly basis don’t know what to do with me, but I decided to give it a shot because I’m running out of treatment options and functioning on a day-to-day basis was getting more difficult. The Gupta Programme is a brain retraining method for ME/CFS, Fibromyalgia and MCS, it was developed by Ashok Gupta, who developed CFS in college. He made the Gupta Programme to share his techniques with others. He describes his Amygdala Hypothesis as stimuli, goes to the Amygdala to be interpreted and then produces the appropriate response. The Amygdala decides if something threatens us it needs to give the appropriate response. Eventually our brains become conditioned and hyperaware. It stays hyperaware because of all the stressful stimuli that is coming in from all our senses and we just can’t calm down. Ashok and my own research says that around 70% of people with Chronic Fatigue Syndrome can remember a virus or toxic trigger, from the beginning of an illness that they never really recover from. And because stress lowers the immune system it’s harder for out bodies to fight off this illness on top of a variety of things that we were already worrying about. Though some people don’t even really remember any virus that they may have developed in the beginning. But it can also stem from a stressful period in someone’s life, mentally, emotionally or physically that stress out the immune system. I’ve always been sick and have always had a poor immune system since I was a baby. I’ve also always been under a lot of stress because most of the time I just can’t calm down. Almost four years ago I lost my best friend in a car accident, and that’s been really hard for me to deal with even now. I think that, that was my main trigger for my Fibromyalgia and CFS that was the hardest thing I’ve ever had to deal with. After that I was in a car accident of my own though I didn’t sustain any bad injuries it did leave me with chronic muscle spasms in my back. After that my Grandfather passed away and then my Great Aunt passed away as well. All of that just felt like a giant pile on me, weighing me down and I was second-guessing myself all the time. I had nightmares all the time for a while; I was unable to get enough sleep to function normally. Through all of this I got sicker and a bit depressed, because even now I have a fear that everyone around me might end up dying before me for one reason or another and then I’ll be left alone. Also for a little over three years I was in a mentally/emotionally abusive relationship where I felt completely useless. And I was in such a state and had been brainwashed, to believe that he was the only person who would ever love me. I was depressed, which made my pain worse and then I would get even more depressed. 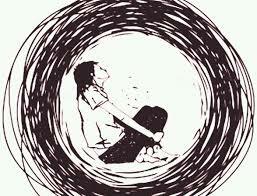 It was a vicious cycle, and my pain became very bad despite what my doctors would do to try to help me. At that time I didn’t really put the cycle together, I just thought that I was getting sicker. It wasn’t until I had completely separated myself from my ex that I really noticed the cycle. I think that was the biggest thing that caused my body to go on high alert, because I was basically living in constant fear that I would do something wrong in my ex’s eyes to set him off, to have him scream at me for days on end. In the Gupta Programme we are taught to sort out our thoughts and stop the negative thoughts. Every time I had a negative thought about myself or my illness I would write it down and ask myself why I had this thought. And what I was doing at the time to trigger these negative thoughts and how can I try to turn these into positive thoughts. Though I would say the parts I liked the most about the program is the reinforcement of daily meditation and positive thoughts along with the webinars. I try to meditate daily, usually in the morning to keep me calm as I start my day, then again at night to wind down to sleep. And the webinars were my other thing that I liked a lot because Ashok is very personable. Before I started watching the webinars I pictured Ashok as someone who would have everything perfectly together and kind of daunting. But he’s actually really nice and personable and he took his time to try to answer, as many questions as possible so we would all feel comfortable throughout the webinar series. So along with the webinars there are DVDs and a workbook that you do daily throughout the program. It branches off a bit from the webinars. Though I found it really useful that I could choose to go a bit more in depth in certain areas that I was unsure of. So all in all I would say this has helped me some with being able to try to calm down my overactive thoughts. If I can stop a large portion of my anxiety early I can avoid really bad flares usually. I’m back to meditating regularly which I think is also helping me sleep more. But I can’t really say how much it has changed me exactly because there are good days and bad days. This isn’t a miracle treatment that will just change you immediately, it’s kind of like exercise, you don’t really notice how much you’ve changed until you can do something you weren’t able to do before. This program is long and requires a lot of hard work to be able to really benefit from all of this. But if you do start this program you can do it self paced because the recordings of the webinars will be emailed to you if you can’t attend the webinar because of time conflicts. I did a fair bit of this program on my own because of time conflicts, but it is possible. Don’t forget that Rome wasn’t built in a day you have to give it time.